I know the topic that I chose to write about this week has been talked about to do death, so I'm hoping to bring something new to the conversation. Pittsburgh Penguins' starting goaltender Marc-Andre Fleury is approaching the most important year of his career this season with a thousand question marks surrounding his future. Fleury, 28, is entering the second to last year of his contract, which expires after the 2014-2015 season. Fleury, who was stellar during last year's shortened regular season, lost his starting job during last year's postseason to Tomas Vokoun and never got it back. Vokoun was too good and Fleury was too bad. The problem is Fleury has now had four straight subpar postseason in a row. He was amazing in net for the Penguins when they lost in the Stanley Cup Finals during the 2007-2008 postseason, and was one of the main factors in their Stanley Cup championship the very next season. Hell, the way Fleury played during game six and in game seven in 2008-2009, I'm not sure if the Pens win that cup without him. That being said, this is a "What have you done for me lately?" league. And lately Fleury has been awful in the playoffs to say the least. Fleury has now had back to back postseasons with a save percentage of under .90; and a goals-against-average over 3.50. For those that are not aware, those aren't just mediocre stats, they are God awful statistics. Right now Fleury has the second most active playoff wins among goalies but is not in the top-35 in career postseason save percentage or goals-against-average. Obviously Fleury has benefited from being on one of the more talented teams in the league, but the last four playoffs the team and himself have seriously underperformed. Fleury has always had a knack of allowing bad goals but making big saves at big times to help the Pens win games. That's what he did the entire 2008-2009 Stanley Cup run. That's what earned himself of salary of $5 million per-year. Spoiler alert : Fleury has not made big saves at big times, at least in the last four postseasons. To be honest, if the Pens don't make the switch from Fleury to Tomas Vokoun during the first round of the playoffs last year, I"m not sure they even win that series. During the game four loss, the loss that cost Fleury his starting job for the rest of the postseason, things got embarrassingly bad. 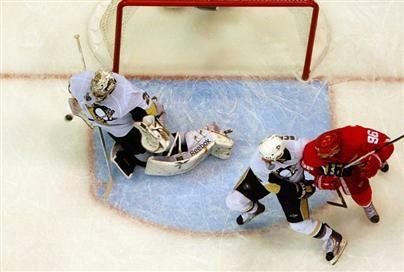 After Fleury lost his job, Vokoun helped shore up the net and led the Pens to the Eastern Conference Finals. It was the first time that the Pens made it best the second round in the playoffs since winning the cup. 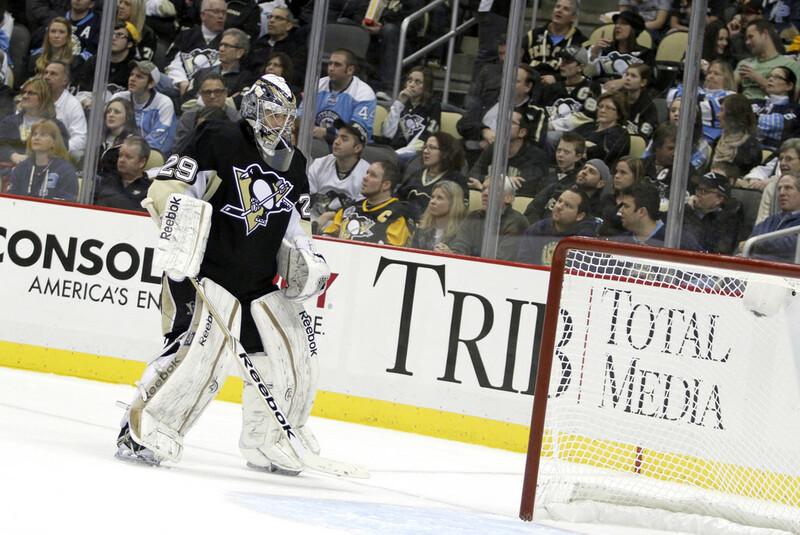 The Fall from Grace that Marc-Andre Fleury is experiencing right now is stunning. After losing his job in the playoffs, Fleury was not even invited to camp by Team Canada for the 2014 Olympics. (Fleury was on the roster of the Gold Medal team in 2010). Then news came out about Fleury going to see a sports psychiatrist. (Side note: Am I the only one that thought about Ricky Vaughn from Major League II when this happened?) Fleury has the talent and the pedigree to be an All-Star goalie once again. As most yinzers will point out, Fleury's problems seem to be purely mental, a lack of confidence if you will. I'll get on board with that, but honestly, I have a problem with the fact that a shrink is going to help Marc-Andre Fleury make a glove save on a wrist shot, or close his five-hole at the right time. If it helps great but I'll hold my breath. When it rains it pours. Fleury, who's won a Stanley Cup, been to an All-Star game, and has just won 40+ games two seasons ago, wasn't even ranked in ESPN"s top-25 goalies. Fleury gets dogged on by the media and the fans now. Again, a huge fall from grace. Will Fleury respond? I have a feeling he will. He's been a very good and consistent starter for the Pens and I have zero doubts that he'll win around 40 games again this year. Obviously he will be judged on what he does in the playoffs. Another stinker will probably end his career in Pittsburgh, as he would probably be a target for a buyout after this season. On the other hand, a strong regular season matched with an improvement in the playoffs will probably lead to Fleury getting another contract extension with the Pens. One thing that will help him accomplish that goal is for the Pens do play better team defense, more importantly, play better in front of their own net. It was one of the biggest reasons why they brought in veteran defender Rob Scuderi. Bottom line is Fleury has no excuses anymore. The Pens have improved their team defensively (on paper), they've brought in a new goalie coach (Mike Bales), Fleury is seeing a sports-shrink, and he has all of the motivation in the world to play with. If Fleury disappoints again there is no question in my mind that his days in Pittsburgh will be numbered.